Veronica Pleasant is a senior double majoring in Animal Science and Pathobiology. She first began research in the fall of sophomore year as a research assistant in Dr. Kristen Govoni’s laboratory in the Department of Animal Science. Dr. Govoni’s lab studies the effects of maternal nutrition on the offspring in sheep, and the effects of maternal lactation status on the offspring in cattle. Veronica is working on her fifth semester in Dr. Govoni’s lab, and has assisted in many capacities over the years. Most recently, she presented a poster titled “The effects of maternal milk production on dairy calf growth and health” at the American Society of Animal Science – Canadian Society of Animal Science Annual Meeting and Trade Show in Vancouver, Canada in July. Veronica has received the OUR Supply Award (Spring 2017, Fall 2017) and the OUR Travel Award (Summer 2018) to perform research in the lab and to travel to present the research she completed. She is also a recipient of the Kinsman Family International Agricultural Fund Award to fund her presentation at the ASAS conference. 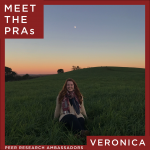 Outside of research, Veronica is First Vice President of Sigma Alpha Professional Sorority, a College of Agriculture, Health and Natural Resources Ambassador, a RISE facilitator, and an undergraduate teaching assistant in the Department of Animal Science. She is also an alumnus of the WiMSE Living Learning Community. She plans to pursue both a DVM and PhD after graduation to fulfill her dreams of becoming a veterinary scientist. Veronica is the first to admit she doesn’t always know exactly what she’s doing, and remembers feeling totally overwhelmed at the prospect of asking a professor to join their lab. If you need any assistance in bridging that gap, Veronica would be happy to help! Learn more about Veronica in her Meet the PRAs interview!